CAPE CANAVERAL, Florida -- United Launch Alliance (ULA) successfully launched the U.S. Air Force's X-37B Orbital Test Vehicle (OTV) into orbit atop a Atlas V 501 rocket Wednesday morning from Space Launch Complex (SLC)-41 at Cape Canaveral Air Force Station in Florida. The sound of a double sonic boom might once again be heard across Florida's Space Coast after the U.S. Air Force left open the possibility of landing this X-37B mission at Kennedy Space Center's space shuttle landing facilities. In 2014, Boeing began consolidation of its X-37B operations at Kennedy Space Center by converting the former space shuttle facility, OPF-1, to a facility that would enable the U.S. Air Force to land, recover, refurbish, and re-launch the reusable unmanned space plane. Prior to consolidation, the 29-foot-long X-37B had launched from both Vandenberg Air Force Base in California and the Cape Canaveral Air Force Station in Florida - but the space plane only landed at Vandenberg Air Force Base. The consolidation of operations at Kennedy Space Center means that future OTV missions will have the option of landing in either California or Florida, an Air Force spokesperson told SpaceFlightNow. This mission, designated OTV-4, will be the fourth mission of one of the Air Force's two secret space planes since the first launch in April 2010. Also referred to as mini-space shuttles, the X-37B program are the only re-entry spacecraft the U.S. launches since the retirement of the space shuttle fleet. The Air Force has not disclosed how long the fourth X-37B mission will remain in space. Although the X-37B was designed for orbital missions lasting 270 days, the last mission (OTV-3) remained in orbit for 674 days. The U.S. Air Force did disclose, however, that a Hall thruster experiment will be aboard the X-37B during this mission. A Hall thruster is a type of electric propulsion device which produces thrust by ionizing and accelerating a noble gas, usually xenon. While producing comparatively low thrust relative to conventional rocket engines, Hall thrusters provide significantly greater specific impulse, or fuel economy. This results in increased payload carrying capacity and a greater number of on-orbit maneuvers for a spacecraft using Hall thrusters rather than traditional rocket engines. How Does a Hall Thruster Work? Hall thrusters trap electrons in a magnetic field and use them to ionize the onboard propellant. The magnetic field also generates an electric field that accelerates the charged ions creating an exhaust plume of plasma that pushes the spacecraft forward. 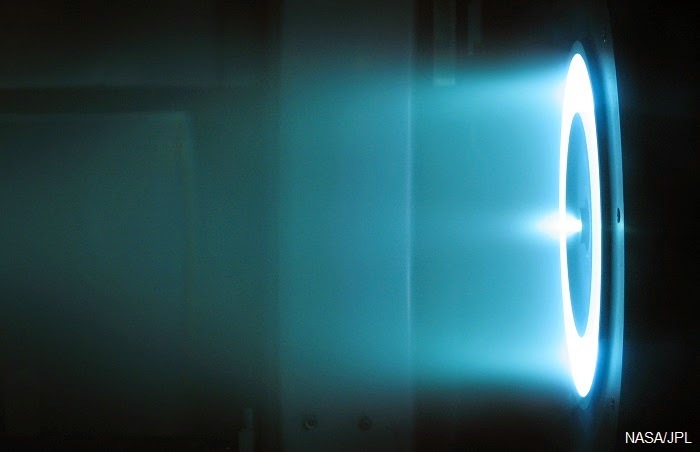 When solar arrays are used to supplement the electrical power, a Hall thruster can be a part of an advanced Solar Electric Propulsion system that uses 10 times less propellant than equivalent chemical rockets. Recently, NASA engineers from Glenn Research Center and the Jet Propulsion Laboratory successfully tested a breakthrough, higher power Hall thruster design in a vacuum chamber on Earth to simulate the space environment. “We proved that this thruster can process three times the power of previous designs and increase efficiency by 50 percent,” said Dan Herman, Electric Propulsion Subsystem lead. According to the Air Force, the Hall thruster that will fly on the X-37B experiment is a modified version of the units that have propelled its first three Advanced Extremely High Frequency military communications spacecraft. The experiment will enable the Air Force to test the Hall thruster design modifications, which are intended to improve performance over previous designs, in a space environment. The experiment data will then be compared to data from previous tests performed on Earth. "Space is so vitally important to everything we do," said Maj. Gen. Tom Masiello, Air Force Research Laboratory commander. "Secure comms, ISR, missile warning, weather prediction, precision navigation and timing all rely on it, and the domain is increasingly contested. A more efficient on-orbit thruster capability is huge. Less fuel burn lowers the cost to get up there, plus it enhances spacecraft operational flexibility, survivability and longevity." A NASA materials science experiment will also fly aboard the space plane during this mission. By flying the Materials Exposure and Technology Innovation in Space (METIS) investigation on the X-37B, materials scientists hope to have the opportunity to expose almost 100 different materials samples to the space environment for more than 200 days. METIS is building on data acquired during the Materials on International Space Station Experiment (MISSE), which flew more than 4,000 samples in space from 2001 to 2013. Researchers are flying some materials as part of METIS that were also tested during MISSE. 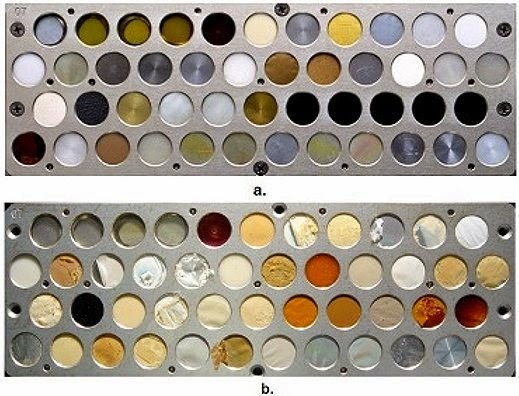 Testing the same types of materials again can help scientists verify results obtained on the International Space Station, NASA said in a release. If researchers see different results between the same type of materials used on both METIS and MISSE, it would help scientists learn about the differences experienced in various orbital environments. Finckenor leads a diverse team of investigators from other NASA centers, aerospace companies, and universities. For both MISSE and METIS, the customers supply small quarter-size samples similar to the ones in the above photo. METIS will fly a variety of materials including polymers, composites, and coatings. Finckenor prepares the samples for flight and helps with post-flight sample analysis. After the X-37B separtes from the Centaur, the rocket will change alt change altitude and inclination in order to release a CubeSat spacecraft which are sponsored by the National Reconnaissance Office (NRO) and the National Aeronautics and Space Administration (NASA). According to United Launch Alliance, the Ultra Lightweight Technology and Research Auxiliary Satellite (ULTRASat) consists of 10 CubeSats contained in eight Poly-Pico Orbital Deployers (P-PODs) Seven of the eight P-PODs contain a total of nine NRO-sponsored CubeSats while one of the P-PODs has one NASA-sponsored satellite.